A popularity of Balanced Advantage Mutual Fund is on the rise. Many investors are investing money in the balanced advantage mutual funds. This type of fund is also known as dynamic allocation fund. A unique characteristic of this category is an allocation of funds between equity and fixed income instruments based on the market conditions. If a market is becoming expensive this fund shifts fund into fixed income component and if a market is down or valuation is cheap funds will be diverted to equity components. The dynamic fund allocation makes it attractive investment option in the volatile market condition. What is Balanced Advantage Mutual Funds? A balanced advantage mutual funds are largely open-ended equity-oriented schemes that invest in equity as well as debt component. Balanced advantage funds work on simple formula “Buy Low and Sell High”. These types of funds are also known as all-weather fund. These funds are expected to do well in all sort of market condition. To take buying and selling decision this fund follows price to book value (P/BV) ratio. When the P/BV ratio of the nifty increases, the fund moves out of equities and enter debt and vice-versa. The primary aim is to buy low and sell high, helping the investor to ride over volatility over the long term. Looking at benefits you must be interested to know about Best Performing Balanced Advantage Funds. Here are few best performing balanced advantage mutual funds. ICICI Prudential Balanced Advantage fund is first best performing fund in this category. The objective of this fund is to generate returns by using arbitrage and other derivative strategies in equity and debt market. It is a dynamic asset allocation fund with stated asset allocation of 65% equity and 35% debt. However, as of today (1st Aug 2018) 40% funds are in equity, 33% is in debt and a remaining fund is in other categories. ICICI Prudential Balanced Advantage has generated 15.22% return in the last 5 years. 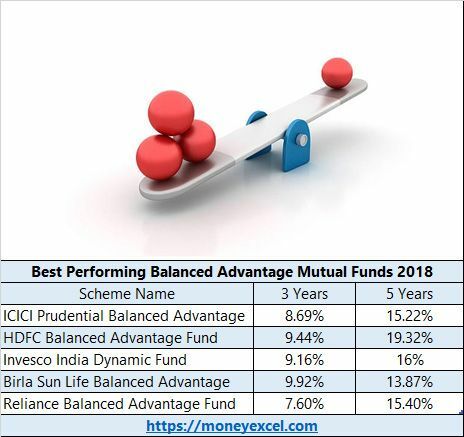 HDFC Balanced Advantage fund is second in the list of best performing fund in balanced advantage category. The fund objective is to provide long-term capital appreciation from a dynamic mix of equity and debt investments. In the last five years, this fund has generated a return of 19.32%. Invesco India dynamic fund as the name suggests it works on dynamic fund allocation. As of now, this fund has allocated 50% fund in equity, 30% in debt and remaining in other assets. In the last 5 years, this fund has generated 16.03% returns. Aditya Birla Sun Life Balanced Advantage Fund is next in the list of best performing funds. Like other funds, this fund also aims to generate long-term growth of capital by doing a dynamic balance between equity and debt. In the last 5 years, this fund has generated 13.87% returns for the investors. Reliance Balanced Advantage Fund is open-ended equity oriented dynamic allocation mutual fund. This fund has generated very good returns for the investor in the past. Last 5 years return of this fund is 15.4%. Note – have generated very good returns in the past that does not mean that it will generate a similar return in the future. You are requested to do independent research before investing in this fund. As fund allocation is dynamic these types of funds are suitable for low or moderate risk-taking investors. Why should you consider Investing in Balanced Advantage Mutual Funds? These types of funds are able to generate returns in every market condition rising, falling or flat. The reason is a dynamic allocation of the fund. You can expect a good return from these types of funds. Balanced Advantage mutual funds always gives better returns compared to fixed deposit. The reason is presence of arbitrage to hedge part of its portfolio against market volatility. A unique feature of this fund is dynamic asset allocation between equity and debt. The fund allocation is based on simple rule of “Buy Low and sell high”. This means possibility of generating return in this fund is high. If you are moderate risk taking investor and planning to invest in fixed deposit or debt fund it is recommended to look at balanced advantage funds for the investment horizon of 3 to 5 years. My question is that i have some amount in ICICI pru val. discovery fund. Its sip completed 2 yrs back.Since then the amount is there in this fund . But as i Observed that returns are not good in this . ICICI Pru Value Discovery is not performing well since past few months.The major holding of these mutual fund is in IT,Pharma,Energy and automobile.One reason of non performance would be these stocks and sector are under performing.If you do peer comparison other funds are doing well. I recommend to switch to other mutual funds. Both fund mentioned by you is debt fund for short term goal.You want to invest 8.4 Lakh by SIP and your target is to get 10 Lakh. It is possible to generate the expected return. However, it is suggested to invest in aggressive equity based mutual funds.